Hidden in an airtight capsule within the Neil Armstrong crypt, archeologists found several rolls of ½ inch magnetic tape which, when decrypted, were found to contain dozens of pages worth of philosophical and epistemological musings from the introspective astronaut, among these what is assumed to be a rough draft of his famous "one small step for man" speech. "This find has at last put to rest the century-old debate over what Armstrong said, or intended to say, during the very first moonwalk," Dr. Encke Kahoutek, a researcher with the Newark International Airport College of Ancient Things, said. "All we've ever had is various brands of conflicting conjecture. Now, with the Armstrong tomb tapes, we have the proof." According to Dr. Kahoutek, careful analysis of the so-called tomb tapes, which were recorded during Apollo 11's three-day journey from the Earth to the moon in 1969, show that Apollo 11 Commander Neil Armstrong had carefully planned and rehearsed his first lunar speech, committing the words to magnetic tape in order to facilitate the memorization process. "For some reason, Neil Armstrong wrote the text down on tape with a magic marker," Dr. Kahoutek said, "rather than using the reel-to-reel recording equipment that had been brought on the mission for the purpose of capturing the first extra-vehicular lunar tuba performance. 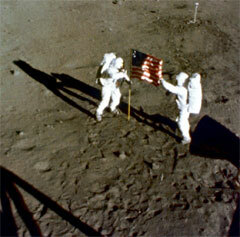 Astronaut Edwin E. (Buzz) Aldrin, Jr., who had practiced tuba for months prior to the journey and was reportedly planning a surprise first-time extraterrestrial vacuum performance of John Philip Sousa's 'Stars and Stripes Forever', was severely miffed by the fact that Armstrong used up all the tape and never shook his hand in public again. The tuba was apparently abandoned near the Sea of Futility." Dr. Kahoutek, who confirmed the authenticity of the written texts by comparing the tapes to Neil Armstrong's signature on antique toy rocket ships, said they not only provide proof of Armstrong's moonwalk intentions but also new insights into Armstrong's character and philosophy. "First of all, there's no 'a' in the texts," Dr. Kahoutek said. "'That's one small step for man, one giant leap for mankind' is precisely what Neil Armstrong intended to say. It's written over 300 times on one 12-inch reel. We believe he was attempting to commit the text to memory by means of repetitive writing, a common method in rote retention. But other texts on the tapes also demonstrate that Armstrong had a passion for tautology. He could apparently find profound meaning in meaninglessness, and vice versa." "The earth is the earth, the moon is the moon, and neither is the other." "I fit in my space suit, which fits around me." "Reminder: NASA short for 'NASA Aeronautics and Space Administration'"
"I'd gladly push Buzz into space for a little tuna fish and salsa sauce. Shhhhh!" "New innovations like space travel provide many alternative options for man." "Wish I could see Torpenhow Hill from here. Oh, well." "Here I am floating in the desolate void of empty space. Why did I not bring a magazine?" "Again with the tuba. Sigh. Buzz will be Buzz." "What is a spaceman? A man. In space." "Either we will run out of oxygen, or we will not run out of oxygen. Either way, I'm not holding my breath." "In the enclosed, secure, circular environment of a space capsule floating in the extremely dangerous environment of space, I find it entirely unsurprising that Armstrong would take refuge in the enclosed, secure, circular logic patterns of tautologies," Dr. Kahoutek said. "It's a well-known defense mechanism, particularly in high-pressure circumstances. Some astronauts resort to it, as the new Armstrong evidence proves, and those that do not, don't."